Well, the fight to pass Constitutional Carry here in Iowa must be fashionable, because I’m happy to announce that Gun Owners of America’s Larry Pratt will be in the legislature tomorrow, to testify on behalf of this bill! And as a member of Iowa Gun Owners, I hope you’ll come on out and join us — and meet Mr. Pratt in the process. 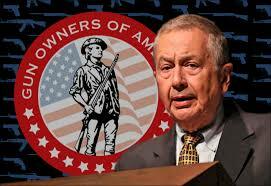 Everyone knows that Larry Pratt is truly one of the finest people fighting for the Second Amendment rights of law abiding Americans. Gun owners also know that GOA is one of the hardest hitting, ‘No-Compromise’ gun rights groups around. That’s why MSNBC hates them. That’s why former Senate Majority Leader Harry Reid hates them. That’s why liberal talk head Piers Morgan hates them. And that’s why former US Senator Robert Torricelli hates them — and urges people to stop giving them money! Wow, does that sound familiar or what? In politics, if weak-kneed politicians, not to mention out and out gun-grabbers don’t despise you, you’re doing something wrong. That’s why we are so proud to have the backing of GOA on this bill, and Mr. Pratt’s confirmed appearance at our sub-committee tomorrow. This session represents our best opportunity to pass Constitutional Carry in years, and it’s an opportunity that won’t last forever. The anti-gun caucus in the Senate are gearing up for a major fight over this bill, determined to stop us. So, if you can, feel free to join us tomorrow. All the information you need is below. Constitutional Carry legislation is very simple. If you’re legally allowed to own a firearm, you would be legally allowed to carry it without government interference. Without having to pay fees. Without having to beg government permission. Without having to add your name to a government database. These are the identical freedoms that gun owners in over a dozen states currently enjoy — with six of those states passing this law in the last two years. And as we’ve been saying since Election Night 2016, the political environment in Des Moines hasn’t been this good for passing pro-gun bills in TWENTY YEARS. We don’t dare let up, not for a moment, as future generations of gun owners are counting on us to secure as much freedom as we can, while we can. The next phase of that fight begins TOMORROW. P.S. The sub-committee over Constitutional Carry law convenes tomorrow at 12:00pm, in Room 22, on the second floor, behind the Senate chamber. As a member of Iowa Gun Owners, you are welcome to attend this hearing to observe or testify in support of this bill. More, I’m pleased to announce that Gun Owners of America’s Larry Pratt will also be present, testifying in support of this bill. Larry has generously agreed to stick around for a while after the hearing to meet with GOA/IGO members, so please make it to Des Moines if you can. And I hope that you’ll chip in a donation of any amount to help us keep the pressure on the legislature to pass Constitutional Carry.